NORMAN — Chalk up another major honor for Baker Mayfield. The former Oklahoma quarterback on Thursday was named winner of the 2017 Manning Award, which was created by the Allstate Sugar Bowl to honor the college football accomplishments of Archie, Peyton and Eli Manning. It is the only quarterback award that takes into consideration the candidates' bowl performances in its balloting. The award is voted on by a panel of local and national media, as well as each of the Mannings. Mayfield, OU's first Manning Award winner, got the nod over fellow finalists J.T. Barrett (Ohio State), Kelly Bryant (Clemson), Sam Darnold (USC), Jalen Hurts (Alabama), Lamar Jackson (Louisville), Trace McSorley (Penn State), McKenzie Milton (UCF), Mason Rudolph (Oklahoma State), Jarrett Stidham (Auburn) and Khalil Tate (Arizona). "I would like to thank the Allstate Sugar Bowl for creating this award in our family's name 14 years ago," said Archie Manning. "It is an honor to have our name associated with the top quarterback in the nation each year. I would also like to congratulate Baker Mayfield, who capped a tremendous career with an outstanding senior season to earn this honor. To say he took a different path to success would be an understatement. I doubt there's ever been a player who walked on to two different teams and reached this level of success." A native of Austin, Texas, Mayfield led the Sooners to a 12-2 record in 2017, a third consecutive Big 12 title, a No. 2 seed in the College Football Playoff and a No. 3 final AP ranking. He set the FBS single-season record for passing efficiency with a rating of 198.9, breaking his own standard of 196.4 that he set in 2016. Mayfield also led the FBS in 2017 in completion percentage (.705), points responsible for (296) and yards per pass attempt (11.5). He set the OU single-season record for total offense (4,938 yards), while his completion percentage and 43 touchdown passes rank second best in school single-season annals, and his 4,627 passing yards rank third. Mayfield, who set a school record with four Big 12 Offensive Player of the Week honors in 2017, threw for a school-record 598 yards in a win at Oklahoma State on Nov. 4. He also set an OU record for consecutive completions to start a game, connecting on his first 16 throws in the Sept. 2 season opener against UTEP. 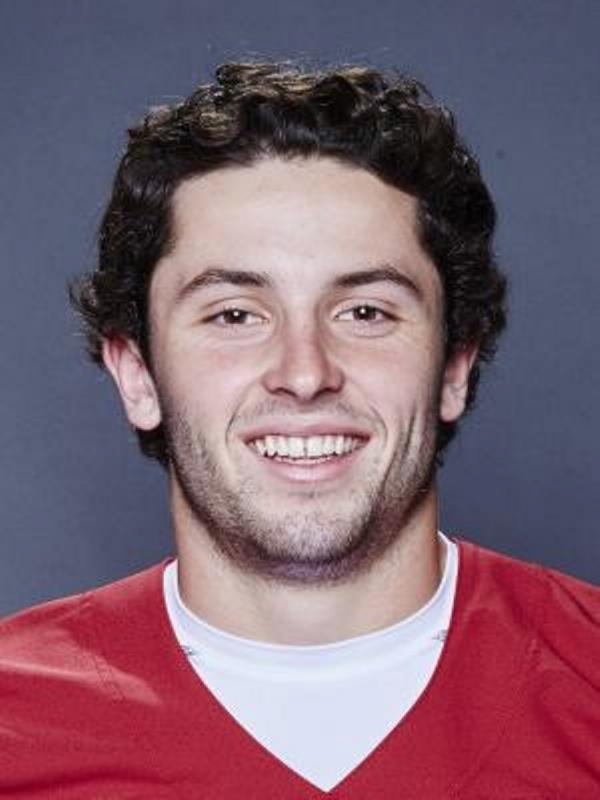 For his career, Mayfield, who started out at Texas Tech in 2013, set Big 12 records for yards per pass attempt (9.7), consecutive games with at least one touchdown pass (40) and touchdowns responsible for (152). He ranks second all-time in the league in passing TDs (131), passing efficiency rating (175.4) and total offense (15,690 yards). Mayfield, who will compete in the Reese's Senior Bowl on Jan. 27 (1:30 p.m. CT on NFL Network), also set the FBS record for consecutive games with at least two TD passes (each of his final 27 contests). He ranks second in FBS history in career passing efficiency rating, third in yards per attempt, tied for fourth in TD passes, fifth in total offense and seventh in career passing yards (14,607). In its first 14 years, the Manning Award has recognized the top names in college football. It has honored quarterbacks from 12 different schools and from four different conferences. The Big 12 Conference (Mayfield, Vince Young, Colt McCoy and Robert Griffin III) joins the Southeastern Conference (Johnny Manziel, Cam Newton, JaMarcus Russell and Tim Tebow) and the Atlantic Coast Conference (Deshaun Watson twice, Matt Ryan and Jameis Winston) with four Manning Award winners each. On Dec. 9, Mayfield became OU's sixth Heisman Trophy winner. The unanimous first-team All-American and Big 12 Offensive Player of the Year also won the Maxwell Award, the Davey O'Brien Award, and Earl Campbell Tyler Rose Award, and was AP, Sporting News and Walter Camp Player of the Year.